Take charge of the welfare, safety, and comfort of your inquisitive canine. Created by Joan Hunter Mayer, a certified professional dog trainer and behavior consultant, the Happy Harness is designed to enhance the human-canine bond. This multi-functional, form-fitting, humane harness is easy to put on and helps ensure that every outing is a positive experience. As a certified professional dog trainer, I have seen and used a variety of harnesses for walking dogs, but I hadn’t come across anything that addressed the needs many pet parents want – myself included. 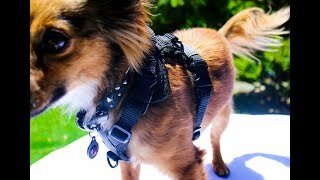 As both a trainer and dog mom, I wanted to create a harness that was so comfortable the dog would never want to take it off, yet still be functional, giving owners’ confidence when using it. No matter the size or age of your pet, the Happy Harness is the ideal device for walking your dog, allowing you to harness fun! Multiple locations for leash attachment, providing you with choices to match the activity. Front clip helps decrease pulling. Back clip for traditional walking and other activities. Escape-proof! Easily adjustable straps that buckle with a smooth connection for a custom fit. Pro-dog: Your inquisitive canine can move freely with special comfortable support behind the upper area of the front legs and snug shoulders fit. Pro-people: Simple to put on your dog, and take off, too. Water-friendly so it’s easy to wash and wipe clean – feel free to let your pup run amok and be a dog! Not just a harness, but a cultural shift! While the TransPaw Gear® Happy Harness ensures an easy, enjoyable, bonding walking experience, it’s also our goal to help move society forward into a mutually respectful space between dogs and humans – thereby creating a positive cultural shift.